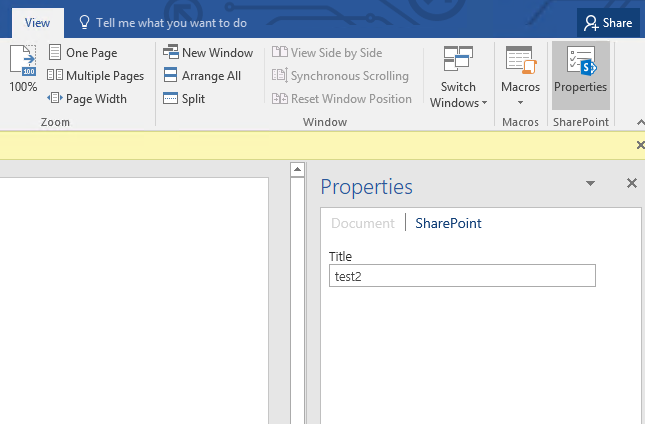 Enables the new Document Information Panel feature that's visible in Word 2013. Does that mean the Document Information Panel is still not available in Office 2016? I thought Office 2013 still had the Document Information Panel. Did they make a new one for 2013 before developing one for 2016? I don't know why this sentence confuses me. Has anyone installed the CU yet and can confirm? The Document Information Panel that you've used in Office 2013 and prior was removed in Office 2016 as the DIP was an InfoPath control, which is no longer updated nor ships with Office. A replacement was made by Microsoft for the Office Click to Run version available via Office 365 (and is not currently available in the Office Volume Licensing version). This new properties pane gives you access to properties as the DIP previously provided. The patch for SharePoint on-prem allows you to use this new DIP. Not the answer you're looking for? Browse other questions tagged cumulative-update office-2016 or ask your own question.